Sony Pictures on Wednesday canceled the Dec. 25 release of its controversial comedy, “The Interview,” after theater chains decided not to play the film following terrorist threats after a cyber attack. “In light of the decision by the majority of our exhibitors not to show the film ‘The Interview,’ we have decided not to move forward with the planned Dec. 25 theatrical release,” Sony said in a statement sent to reporters. “Sony Pictures has been the victim of an unprecedented criminal assault against our employees, our customers, and our business,” the company said in the statement. Intellectual property, private emails, and sensitive proprietary material were stolen, Sony said, apparently to thwart the release of a movie that attackers did not like. 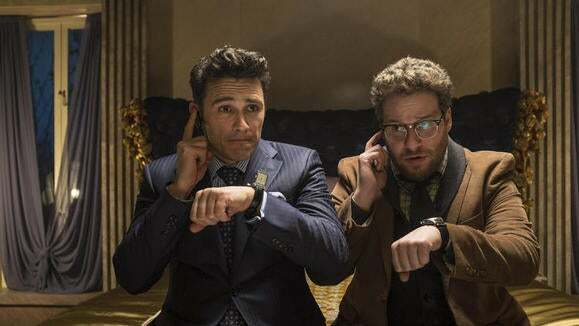 The movie stars James Franco and Seth Rogen as two goofy journalists who land an interview with North Korean leader Kim Jong Un and are instructed by the U.S. Central Intelligence Agency to assassinate him. Sony made the decision after the chains, which included Regal Entertainment Group, AMC Entertainment Holdings, Carmike Cinemas and Southern Theatres, said they would delay the release of the film after the fallout from the three-week-old cyber attack against Sony, and subsequent terror threats. “Carmike must take threats against movie theaters very seriously and the recent unprecedented cyber attacks against Sony Pictures are no exception,” said the Columbus, Georgia-based chain, which operates 278 theaters in 41 states, in a release on Wednesday. “Due to the wavering support of the film, as well as the ambiguous nature of any real or perceived security threats, Regal Entertainment Group has decided to delay the opening of the film in our theaters,” that chain of nearly 600 theaters said in an emailed statement. U.S. intelligence officials have since concluded that the North Korean government was “centrally involved” in the cyber attacks on Sony’s IT, according to a New York Times report published Wednesday. It’s unusual for theaters to cancel the opening of a film within a week of its release. Sony did not respond to a request for comment on whether the studio would release the film in theaters later, release it on an in-home digital format, or scrap it entirely.